Souffle like you have never had before. Better than any onion soup I have ever made. Anyway, here’s the recipe I came up with, hope you enjoy it as much as we have. It always brings back memories of our trip to Napa. I adapted both of these recipes from The Joy of Cooking. 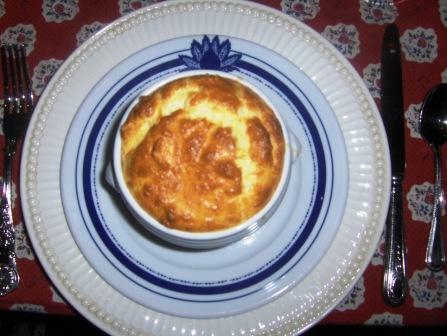 You can take any onion soup recipe and any cheese souffle recipe and make this recipe. Bon Appetite! Melt the butter and olive oil in a soup pot over medium-low heat until the butter is melted. Add the onions and thyme and stir to coat with the butter/oil mixture. Cook the onions, stirring occasionally until they start to caramelize. This may take 30-40 minutes. You want a rich brown color. Stir in the cognac and increase temperature to medium high. Stir in the beef broth. Reduce the heat and let simmer partially covered for 20 minutes. Season with the salt and pepper. Keep the soup hot while you make the cheese souffle topping. To make the white sauce you want to melted the butter in a saucepan. Whisk in the flour until well blended and smooth. This will take about 1 1/2 minutes. Remove the pan from the heat and slowly whisk in the 1 cup milk. Return the pan to heat and bring to a simmer, whisking constantly to prevent lumps. Continue to cook, whisking until the sauce is smooth and hot and has thickened, 1 to 2 minutes. Season to taste with salt, pepper and nutmeg. Remove the white sauce from the heat and let stand for 30 seconds. Add, stirring well the Parmesan and Gruyere cheeses. Add the egg yolks one at a time, mixing well after each addition. Beat the egg whites until stiff but not dry. Fold the whites into the cheese mixture. Now you are going to ladle the soup into the bowls, leaving about 3/4-1″ at the top. Put the souffle topping on each bowl of soup. Put the bowls on a cookie sheet and bake at 350° for about 20-25 minutes or until they are browned. Try this first without the bread or extra cheese on top of the soup and you may find that you do not need the bread or croutons. I have never had this souffle fall. I think it is because the soup is hot and steaming and even after removing from the oven, we have never had them fall. I sometimes sprinkle more parmesan on top of the souffle before putting in the oven. Hope you like this one. Thanks for that, and for anyone that is having trouble chopping onions without the crying, here’s an incredibly simple tip – put them in the fridge first, then chop them straight away after taking them out! No more tears! I found some more onion soup recipes here if anyone wants to try some more recipes.